Option that delays collision checking procedures. When it is enabled, all neighbors are sorted by cost. The planner then goes through this list, starting with the lowest cost, checking for collisions in order to find a parent. The planner stops iterating through the list when a collision free parent is found. This prevents the planner from collision checking each neighbor, reducing computation time in scenarios where collision checking procedures are expensive. Get the state of the delayed collision checking option. Controls whether the tree is pruned during the search. This pruning removes a vertex if and only if it and all its descendents passes the pruning condition. The pruning condition is whether the lower-bounding estimate of a solution constrained to pass the the vertex is greater than the current solution. Considering the descendents of a vertex prevents removing a descendent that may actually be capable of later providing a better solution once its incoming path passes through a different vertex (e.g., a change in homotopy class). Get the state of the pruning option. Get the current prune states percentage threshold parameter. Use the measure of the pruned subproblem instead of the measure of the entire problem domain (if such an expression exists and a solution is present). Currently the only method to calculate this measure in closed-form is through a informed sampler, so this option also requires that. Get the state of using the pruned measure. Get the state of the new-state rejection option. Controls whether pruning and new-state rejection uses an admissible cost-to-come estimate or not. Get the admissibility of the pruning and new-state rejection heuristic. Controls whether samples are returned in ordered by the heuristic. This is accomplished by generating a batch at a time. Get the state of sample ordering. Set the batch size used for sample ordering. Get the batch size used for sample ordering. A meta parameter to focusing the search to improving the current solution. This is the parameter set by CFOREST. For RRT*, search focusing consists of pruning the existing search and limiting future search. Specifically, this is accomplished by turning on informed sampling, tree pruning and new-state rejection. This flag individually sets the options described above. Get the state of search focusing. Updates the cost of the children of this node if the cost up to this node has changed. Computes the solution cost heuristically as the cost to come from start to the motion plus the cost to go from the motion to the goal. If the parameter use_admissible_heuristic (setAdmissibleCostToCome()) is true, a heuristic estimate of the cost to come is used; otherwise, the current cost to come to the motion is used (which may overestimate the cost through the motion). Add the children of a vertex to the given list. Check whether the given motion passes the specified cost threshold, meaning it will be kept during pruning. Option to delay and reduce collision checking within iterations. The status of the tree pruning option. The tree is pruned when the change in solution cost is greater than this fraction. Option to use the informed measure. The status of the new-state rejection parameter. The admissibility of the new-state rejection heuristic. Option to create batches of samples and order them. The size of the batches. Stores the start states as Motions. The cost at which the graph was last pruned. J. D. Gammell, S. S. Srinivasa, T. D. Barfoot, "Informed RRT*: Optimal Sampling-based Path Planning Focused via Direct Sampling of an Admissible Ellipsoidal Heuristic." In Proceedings of the IEEE/RSJ International Conference on Intelligent Robots and Systems (IROS). Chicago, IL, USA, 14-18 Sept. 2014. DOI: 10.1109/IROS.2014.6942976. Illustration video. Short description video. 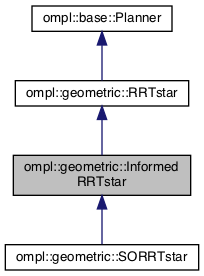 Definition at line 68 of file InformedRRTstar.h.